3rd ODI India vs Australia: With four overs to go, former India skipper MS Dhoni showed composure and presence of mind as he went up to the umpires to find out what are the bowling options left at Australia's disposal. 3rd ODI India vs Australia: With four overs to go, former India skipper MS Dhoni showed composure and presence of mind as he went up to the umpires to find out what are the bowling options left at Australia’s disposal. Dhoni remained unbeaten on 87 as India cruised to a seven-wicket win at Melbourne Cricket Ground to win the series 2-1. The 37-year-old veteran also bagged the Man of the Series award for being the highest run-getter in the three-match series. Dhoni amassed 193 runs in three innings at an average of 193 as well as he was dismissed just once in the series gone by. 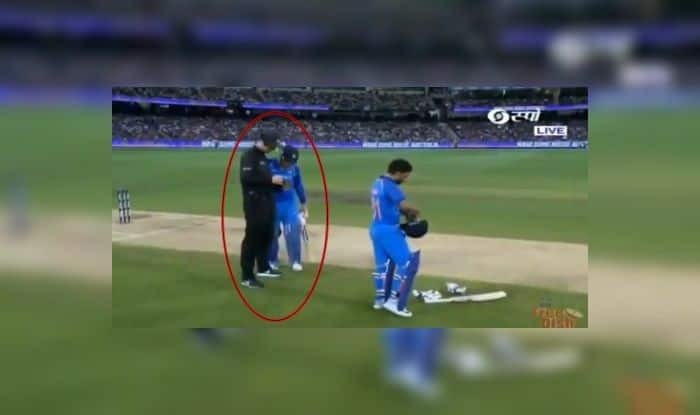 Here is Dhoni showing his finishing instincts as he walks up to the umpire to get details of the options Australia have at their disposal. Earlier, Kedar Jadhav also contributed with a handsome knock of 61 runs off 57 balls. Both Dhoni and Jadhav knitted a crucial 121-run partnership for the fourth wicket to take India home. For India, it was Yuzvendra Chahal’s career-best figures of six for 42 that set it up for the Indians. Chasing a moderate target of 231 to win, India didn’t get off to the best of the starts as vice-captain Rohit Sharma fell cheaply. However, captain Virat Kohli (46) once again came to the fore with another solid batting display. The batsmen got counted when it mattered as India have capped off a successful tour of Australia with a seven-wicket win at MCG. India will soon take on New Zealand in their den for a limited overs series, starting January 23 with the ODIs, followed by the T20Is.